and that "barrier" is all? 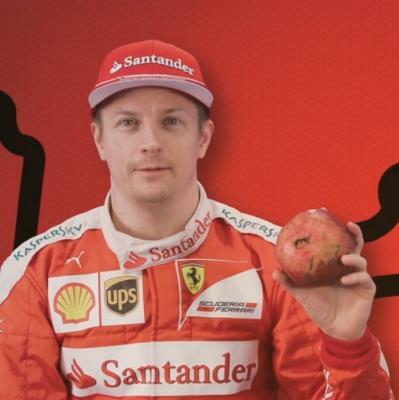 Why did they give Kimi a pomegranate? Kimi Raikkonen is hoping his form will improve in warmer conditions, after difficult recent races with Ferrari in Formula 1. Raikkonen finished second in May's Spanish Grand Prix, but crashed out in Monaco and was a distant sixth in last Sunday's Canadian GP, where team-mate Sebastian Vettel finished second. Ferrari struggled to get the Pirelli tyres working properly through qualifying in Spain and Monaco, but Raikkonen was quicker than Vettel at Barcelona and only 0.180 seconds adrift in Monte Carlo. In Canada he qualified 0.589s slower than Vettel and finished the race nearly a minute behind the sister Ferrari. In the last two races he has also slipped from second to fifth in the drivers' championship. Raikkonen reckons the cold conditions in Montreal exacerbated difficulties in getting the tyres to work properly on his car. "It's a lot of small things, and when you add them together with the conditions we had - it was very cold - it was just tricky to make the tyres work as we want," Raikkonen explained. "Probably the set-up could have been better in certain places, but sometimes it's very hard to make the right things with the set-up if the tyres don't work in the first place. "If you struggle to switch them on it dictates so much. "This year has been quite cold most races and that hasn't helped. "We know we like it more when it's warmer and it's more easy to make the tyres work, but it's the same for everyone, we just need to make a better job out of it." Conditions in Azerbaijan for this weekend's European GP are expected to be significantly warmer than those experienced in Canada. "We know once we get the car where we want we can be fast, but it's a very fine gap between making it work well and being a bit on the outside of the window," Raikkonen added. "It makes a big difference in laptime. "We struggled a bit the last few races, it's not been easy, but it's a new weekend again, a new place. 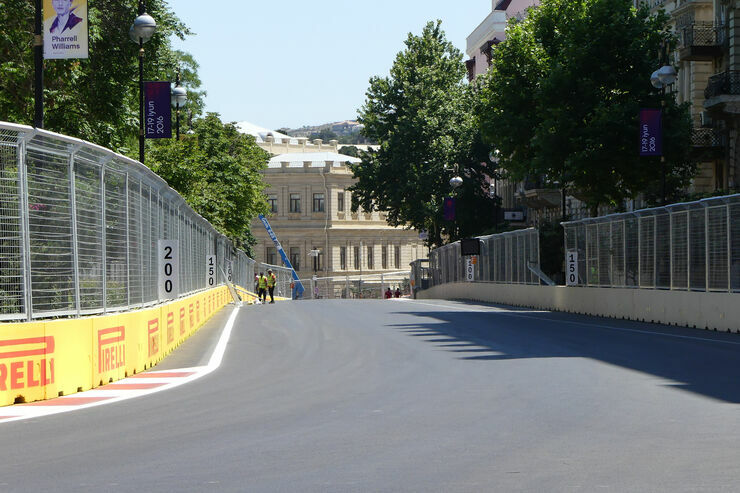 "We need to make sure we get the car where we want it to be, make the tyres work as we want, and I'm sure we'll be OK."
Jenson Button believes Formula 1 has gone "backwards" in some aspects of safety with Baku's new street circuit. 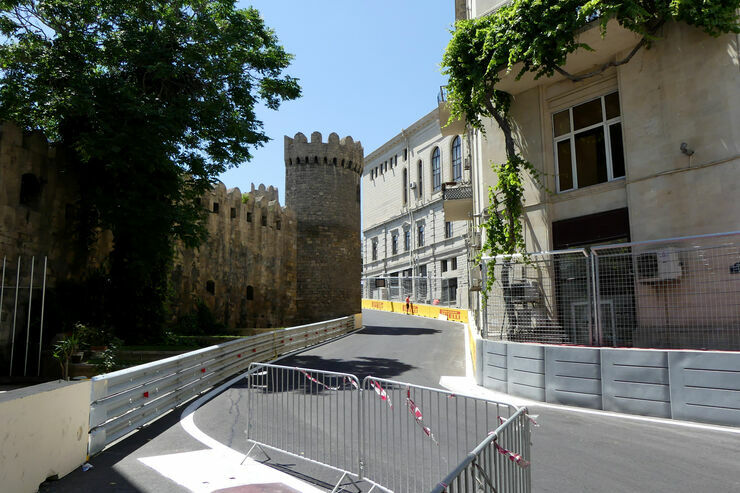 The McLaren driver cited a lack of runoff and narrow escape roads at several points on the 3.732-mile, 20-turn European Grand Prix venue in Azerbaijan, plus a tight pit entry. Drivers enter the pits off the high-speed straight into a chicane that is then followed by 100 metres of straight track before the white line marking the pit speed limit. When Button was made aware of the white line being 100m after the chicane he said: "It is like we have gone backwards in certain areas, I don't know why. "Maybe the circuit was supposed to be the other way around. It is just how it is. "It is a shame because a lot of the circuit is good and you look at the condition of everything, it does look very good. "I do like the layout, it is exciting in some places but some things look like they need to be addressed. "The bit I don't like is a few corners. "We work so hard on safety, improving circuits all the time and we come here and we have corners like T3, T7 and T14 that don't have any runoff at all. 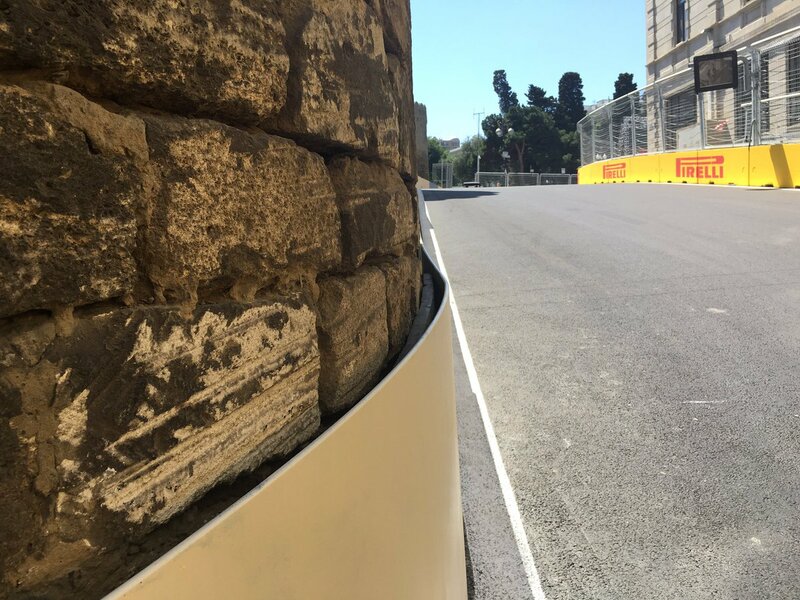 "Turn 7 has three Tecpro barriers and then a concrete barrier at the edge of the circuit. "There is not much you can do because there is a building in the way. It is a shame really." Button underlined drivers are confident the FIA will make sure the track is safe. 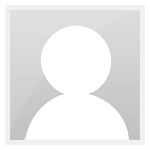 "We all do as drivers trust the FIA and they do a fantastic job of keeping us safe," he said. "They have improved pretty much every circuit we go to, including Monaco. "But running around it just looks like there is little runoff. Hopefully I am wrong." Red Bull's Daniel Ricciardo said he likes the pitlane entry. "It's going to be quite cool because the pit entry is always a part you can gain a little bit of time," he said. "This one in particular I think if a driver gets it right and a driver doesn't quite go in there as committed or makes a mistake, there's easily half a second if not a second on that pit entry, between a good one and a bad one. "You either crash or you lose a lot of time. "Maybe what you do on the pit entry can dictate who wins that position. I like it actually." When asked about Ricciardo's comments about gaining time, championship leader Nico Rosberg said: "Yeah but there's also a massive accident to be had if you go a little bit more than that." Sauber's Marcus Ericsson added: "You are going to have to brake and turn and then it's sharp right-left and then you sort of brake again for the speed limiter. "I don't mind, but I see that it could lead to big accidents going into the pit and I'm not sure that's what we want." Rosberg said there was a "little bit of a concern" with the runoffs, adding: "There's that corner, 14 I think, going down the hill, you have a wall straight on. Turn 3 and pit entry as well, so that's not fantastic." 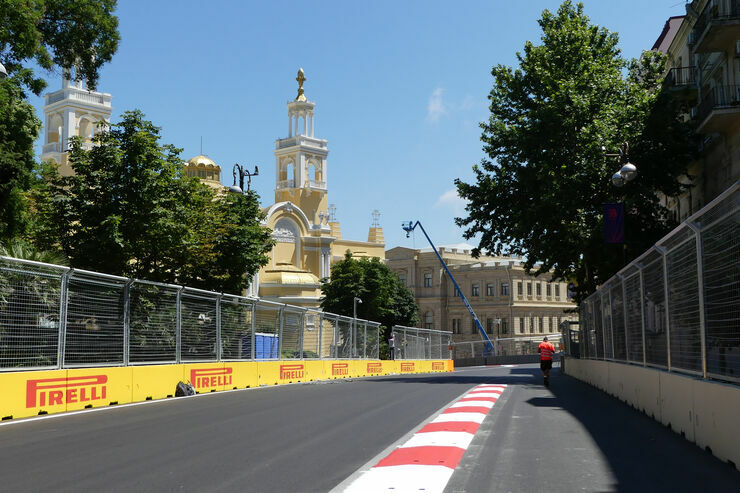 Kimi Raikkonen said Ferrari was struggling to get the tyres to work over one-lap after he and Formula 1 team-mate Sebastian Vettel struggled for performance in second Baku practice. Vettel was the quickest Ferrari, but he was 1.996 seconds off the pace in eighth while Raikkonen was 11th, nearly half a second further back. "We don't know what the others are doing, but when everything worked the balance was kind of OK," said Raikkonen. "But it was more about trying to get the tyres to work for one lap and this seems to be a difficulty right now. "They don't work exactly like we want and the challenge is to switch them on. "More laps seem to help but over one lap it's clear we need to find something to get the grip out of them." Both Ferraris had mechanical problems at the end of the afternoon. Raikkonen locked up on the run to Turn 4 and stopped in the escape road before reporting a problem with the car, believed to be to do with the MGU-K.
"The car just stopped but I don't know the reason," said Raikkonen. "Something happened, the team will find out once the team have got the car back." Vettel said he was called back as a precaution, adding: "I didn't have a problem, obviously Kimi had. "We took precautions as something similar might happen so we took it easy." Despite Ferrari's apparent lack of pace, Vettel remained upbeat. "We had a decent day, we did a lot of laps," he said. "We have the pace., we just struggled to find it. "I don't think we had a bad day. "We got to know the track, that was quite interesting and was the main objective for today. "[The two-second gap to Mercedes] is not nice, it's not good news. but some of it we can explain and other bits we have to wait to see what tomorrow brings. "It's been a tricky day for us, maybe not entirely clean if you look at raw pace but then again it's Friday so no need to worry." 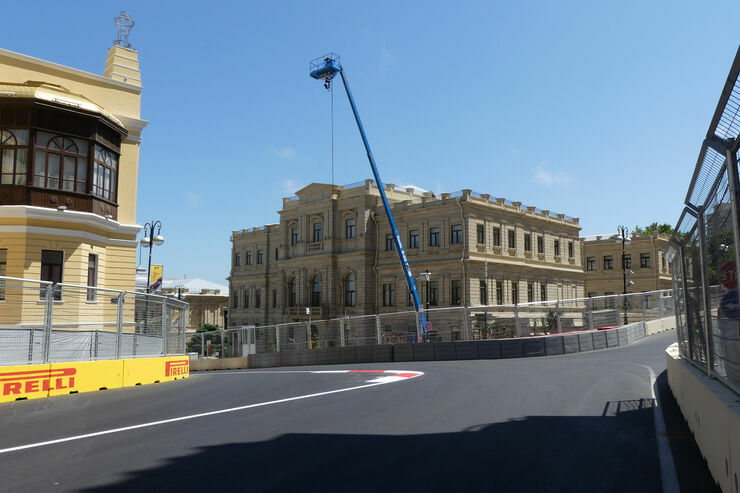 Nico Rosberg claimed a comfortable pole position for the European Grand Prix in Azerbaijan, as Mercedes Formula 1 team-mate Lewis Hamilton crashed out in Q3. 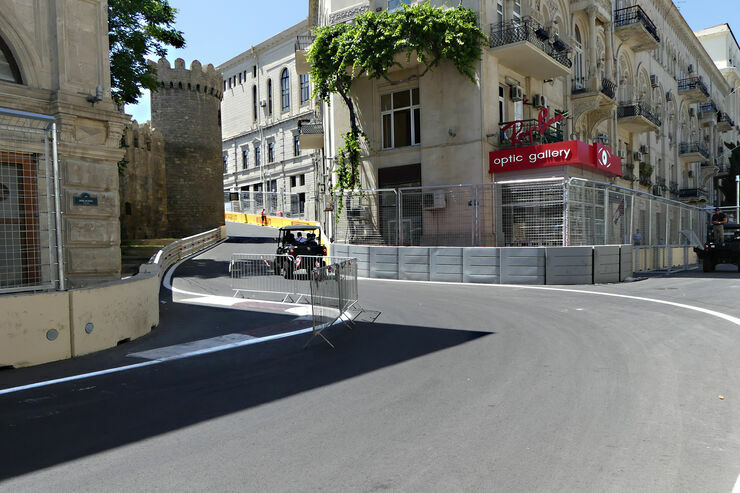 Rosberg glanced the wall during his own final qualifying run at the Baku city F1 circuit, but still did enough to claim top spot by nearly eight tenths of a second. Hamilton had earlier set the fastest time of all in the first sector but went off at Turn 15. He regrouped and tried again, matching Rosberg's pace in the first sector, but clipped the inside wall at Turn 12 and broke the front-right suspension on his Mercedes. That caused the session to be red-flagged, and eventually left Hamilton down in 10th on the grid, without having set a proper time in Q3. It was a messy session overall for the reigning world champion, who went off during each segment. Sergio Perez therefore finished the session second fastest for Force India, but he will start seventh thanks to having to change the gearbox following a crash at the end of final practice. Daniel Ricciardo and Sebastian Vettel set identical times, over four tenths down on the Force India, but Ricciardo took third spot on account of being first across the timing line so inherits the front row position. "Oh come on, you're joking!" rued Vettel, after Ferrari broke the bad news over team radio. Kimi Raikkonen and Felipe Massa rounded out the top six, ahead of Daniil Kvyat, the second Williams of Valtteri Bottas, and the second Red Bull of Max Verstappen, who almost collided with Bottas during their first runs in Q3. Romain Grosjean's Haas came within a tenth of making the top 10, but ended the session 11th fastest, ahead of the second Force India of Nico Hulkenberg, who spun on his first run in Q2 and was only 12th fastest on his second, complaining over team radio about a miscommunication of his run plan. The second Toro Rosso of Carlos Sainz Jr was 13th, ahead of Fernando Alonso's McLaren-Honda and the second Haas of Esteban Gutierrez, who went off at Turn 7 on his final flying lap. Felipe Nasr got Sauber through to Q2 for the first time since April's Chinese GP, but couldn't go any quicker in Q2 so finished up 16th fastest. Rio Haryanto was fractionally faster than Mercedes junior Pascal Wehrlein, and both were quicker than Jenson Button's McLaren-Honda, which wound up 19th after backing out of his final flying lap in Q1. He ended up 0.054s down on Wehrlein and cursing over team radio. Marcus Ericsson was 20th for Sauber, despite grazing a wall on his final lap, while Renault pairing Kevin Magnussen and Jolyon Palmer brought up the rear of the grid. It hasn’t been an easy weekend, but today in qualifying we managed to make the car nicely balanced, the feeling was good and obviously it was a lot faster than earlier this weekend. I felt I could drive it as I wanted and it was a good feeling. In my last run in Q3 I had fitted a new set of Supersoft tires, but then the red flag came out and I was not able to improve my lap time. After that, with only 2 minutes in the session, everybody tried to rush out and do a last lap, but there was traffic in the out lap and the timing was very tight. I’m sure that if we could have run smoothly it could have been better, but if you look at how tricky the weekend was so far, we can happily take this result. Obviously we are not here to finish fifth and today I felt there was more to come from the car. In many ways it will be a long and tricky race for everybody, we just need to do our best, make the right choices and see what will happen. Tania- did you hear/read something? I read in tumblr that Marchionne told Kimi has a stomache issue? Not sure about the source. I know that Marchionne has been interviewed by Sky and Raisport. I was watching Sky and he said nothing about this, maybe during the interview for Raisport. But I've recorded it, so I can check later. Enjoy the Race, everyone!! I am out of town and about to take a long drive. I'll probably catch the start and then be on the road. Please our Boy! That penalty is ridiculous, and that team order... useless. Anyway, wonderful race from Kimi.